One piece construction provides excellent resistant to harsh acids and corrosives. 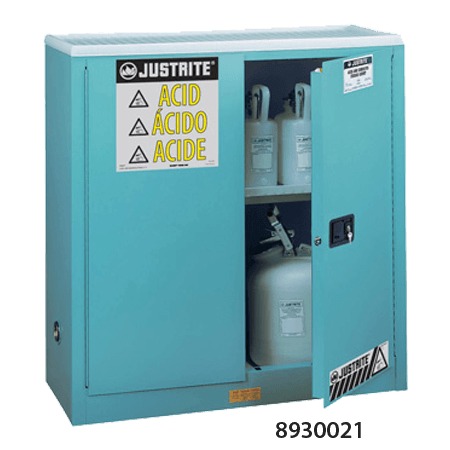 These blue, hollow-bodied, polyethylene cabinets withstand highly corrosive acids and offer maximum protection against chemical corrosion and leaks. Both models are clearly labeled for ACID contents and accept a padlock (not included) for added security. 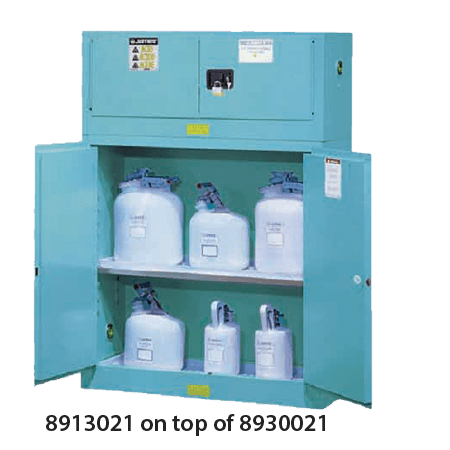 Countertop Cabinet stores up to two 1-quart (4-L) bottles. Door can be hinged from either side for best worktop space utilization. Polyethylene spill tray inside contains leaks and can be removed for easy cleaning. A separate polyethylene tray stores under the cabinet and can be used as a handy work tray. Under counter Cabinet holds up to thirty 1-quart (4-L) containers. 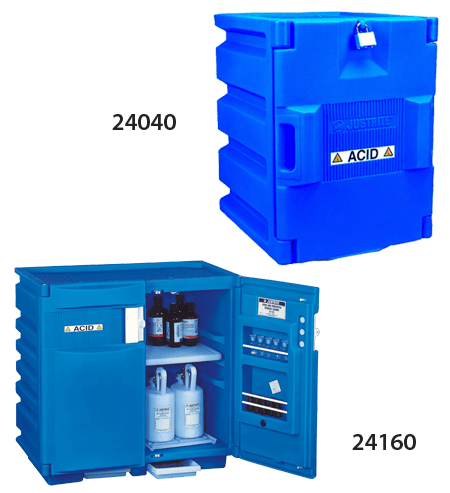 Two segregated compartments each with an adjustable shelf let you store a variety of containers while recessed area in both doors hold small containers. Two removable sumps slide out for easy cleaning of incidental spills. Two vent holes (with removable caps) at rear accommodate pressurized vapor removal systems. Adjustable Shelves Approv / Lstg Regulation Sure-Grip Model No. 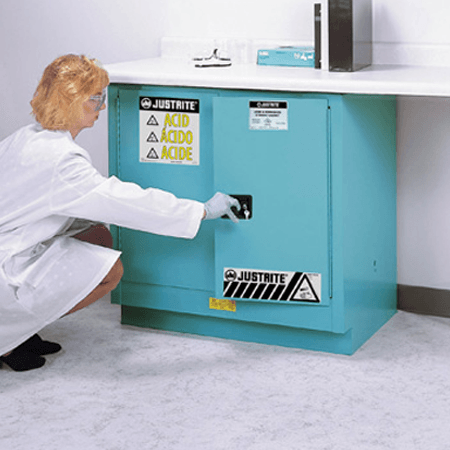 Safely store corrosives under a workbench or lab counter for quick and easyaccess. 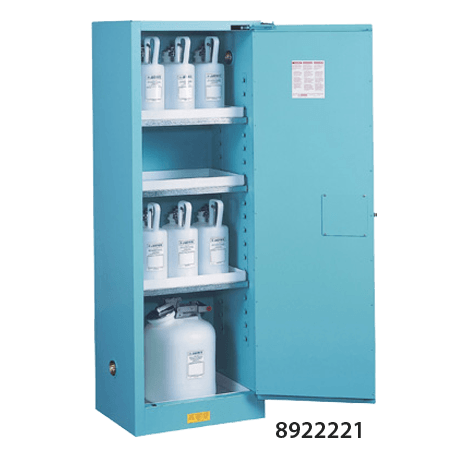 These safety cabinetsincorporate the same quality features as Justriteflammable cabinets but also include galvanized steel shelves withattachedpolyethylene trays and a separate polyethylene bottom sump liner that can beeasily removed for cleaningdrips and leaks. Baked-on blue epoxy powder-coatfinish-inside and out-resists acids, bases and solvents foradded chemicalresistance. FM approved.